an independent fabrication' club racer is built as a light tourer, or would have been had this version not borne track ends for the fixed gear it arrived with. this is a bona-fide, off the shelf option from indyfab in somerville massachusetts. the frame is offered in either steel or titanium and can even be had with s&s couplings to turn it into a folding bike. 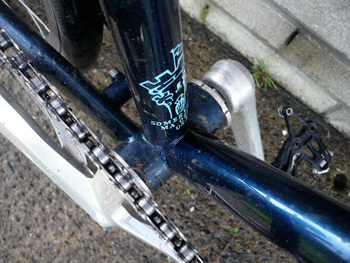 the lovely dark metallic blue bicycle i have been riding is made from steel, though exactly who's steel, i cannot tell. if state that they use a combination of reynolds, true temper and columbus, depending on the rider's build. since this one wasn't built for me, and i've only met joe ingram of indyfab very briefly, i'm pretty sure they didn't have me specifically in mind when they welded it. indyfab have eschewed lugs in favour of tig welding, welds that are rather tidily done, retaining the smooth style of the artisan where the tubes meet each other, and rather spindly tubes at that, if truth be told. how much of this spindliness is relative to the current diet of colossal carbon i'm really not sure, but it sure looks great to me. the giveaway to its touring heritage is all over the place, even if you hadn't looked at the club tourer page of the indyfab catalogue. 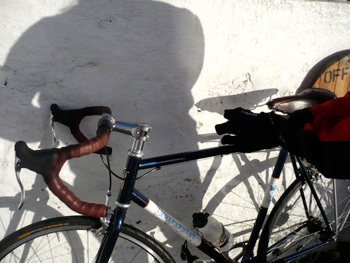 this bicycle arrived with a tubus aluminium alloy, four point rack fitted which, to my shame, i didn't ever make use of. it has a very ingenious method of ensuring that the top remains parallel to the ground by fixing two tubes to the seatstay bolts then the rack frame is allowed to slide along until flat. neat. there are bottle cage bolts on down and seat tubes, while the unicrown, straight steel fork has mudguard eyes and rack mounts for a low rider. track ends at the rear look very purposeful and are also fitted for rack (obviously) and guards. unlike the upper echelons of racing bikes, there is quite substantial clearance between the rear tyre and the seat tube, easing the fitment of guards (fenders) - there's even an allen bolt fitted to the bottom bracket bridge just ready and waiting. in stark contrast to the current trend for massively oversized and rigid bottom bracket shells, this one is entirely in keeping with the spindly nature of the remaining round tubes, so the bike looks quite comfortable with itself. paintwork is deep and metallic blue, with contrasting white panels bearing the legend 'independent fabrication' on both down and seat tubes. classic. 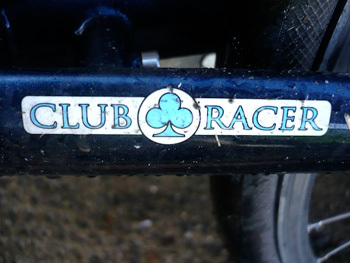 however, a substantial proportion of the cost of the bike may well have been spent on the stunningly beautiful head tube badge which makes those iron-on transfers that italy generally provides us with, look decidedly cheapskate. truly a badge of honour, and just a pity it's out of view when you're riding the bike. the finishing kit on this bike is more than just desirable. the wheels are based on a black anodized pair of phil wood track hubs laced three cross to mavic open pro rims. there is not a quick release skewer in sight, as both front and rear hubs are affixed via very long allen key bolts which thread into the axles. very cool, very neat and immensely practical. 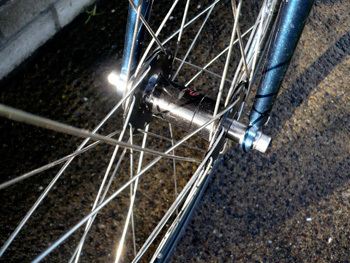 the rear hub is of the flip-flop variety, allowing the fitting of different sized fixed sprockets on each side. or perchance, a single speed freewheel. so understated are the hubs, that i initially thought they were no-name cheapies. i hadn't seen the the script phil in fire engine red writ small on each hub shell. anything but cheap. rubber is of german origin: continental gatorskin 700 x 23mm. 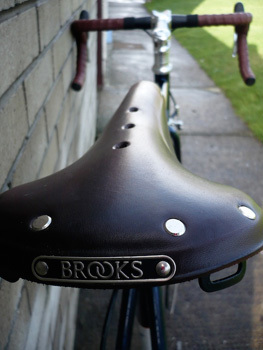 the saddle was a brand new brown brooks b17 leather which rather begs the question as to why you'd want to fit anything different. it's bolted to a slightly nondescript, but nonetheless perfectly capable black alloy seatpost - a very long, alloy seatpost. the brooks theme is continued onto the truvativ anatomic handlebars through the use of brown peerforated brooks leather bar tape. understated elegance probably not befitting this rider. i daresay if you're one of the mash sf crew, brakes on a fixed would be probably be regarded as sacrilege, but some of us are old and fragile, and scared of not stopping in time. this is handled by a shiny pair of tektro calipers operated by cane creek levers. pedalling duties have been left to the ubiquitous sugino 75 chainset, bearing 170mm arms and, in this case, a 49 tooth campagnolo pista chainring. 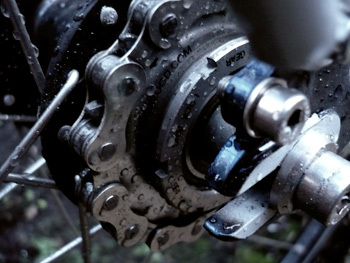 having nothing to do with the current trend for trendy chainsets and external bearings, the chainset revolves on a square taper ta cassette bottom bracket. tried, tested and just fine by me. other revolving duties required by the steering are expertly taken care of by a shiny 1 1/8" chris king headset. anyone would think i was the first person to have ever learned to ride a fixed gear bicycle, such has been my propensity to post brief teasers on the post during my testing (in every sense of the word) period. sad to say it was somewhat of a revelation to me that i actually managed it, but it's definitely the first time i've had to learn to ride a bike before i could review it. due to a total inability to clip in both feet while the bicycle was in motion, initial forays into the big wide world on a bike that goes backwards if you don't pedal properly, are best described as tentative. under such circumstances, the concentration on the principle of motion rather outweighed any observations as to the nature of the beast. as confidence increased, forward motion improved and clipping of cleats became less of a major consideration for all concerned. once relaxed and convinced of being in control, it's a novel concept to discover the joys of riding a bicycle rather than a groupset. indyfab measure their frames on a centre to centre basis, but since the seat-tube stretches a bit past the top of the top tube, comparing like with unlike, gave me a 58cm frame, and a 58cm top tube. the top tube length along with the thomson 110mm stem was just ideal, and to be honest, despite very little seatpost showing under that brooks saddle, the bike was comfortable enough, and not quite the handful i had prepared myself for. of course, aside from not having ridden fixed with any degree of skill or ability before, the combination of a 49 campag chainring and a 16t sprocket, meant that i was massively overgeared: if you do the arithmetic, this combination tops out at 83". 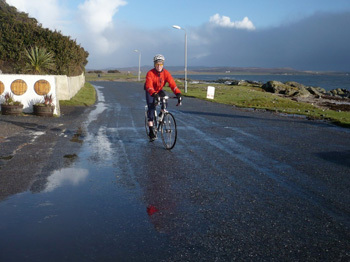 mosquito sent me up a sprocket with more teeth (18), but even that proved a bit of a struggle in islay's headwinds. granted, it was an armchair ride when that wind was behind me. worryingly, when asking mosquito for another sprocket, the death by terror instructions were to tighten the sprocket on the phil woods hub with a track chainwhip, before tightening the lockring within an inch of its life 'if there's any movement at all, it'll strip the thread'. on a £130 plus hub, that's scary. that var lockring tool bought almost twenty years ago finally earned its keep. having ridden almost nowt but carbon for the past five or six years, the indyfab was a timely reminder of just how good steel really is. why on earth we ever let ourselves be persuaded away by aluminium in the first place would make for an interesting lunchtime discussion. and as for those massive bottom bracket shells taking place on anything that looks like it might be ridden by a sprinter, the club racer's looked remarkably svelte, verging on anorexic. mainly because it is. however, if you combine the gear size with my struggle to climb hills in said gear, there was no appreciable movement from down there at any point during the test. with reference to the relative enormity of the frame, standing up to climb was really the only point at which the size made itself known. not one for any retarding antics on fixed wheel, i was very grateful for front and rear calipers; not for me the frantic back pedalling as a means of stopping, and there is not a chance in heaven that i could ever attempt a trackstand. the ground looks far too hard and too ar away for that. in a straight line on a straight(ish) road, speed and stability were exemplary, as well as comparable manoeuverability at slow speed. sadly, i never had cause to use the tubus rack, not out of disfavour, but just because i never had anything to carry. however, in this particular guise, the club racer has the forks at both ends set up for racks and mudguards, making it a practical machine as well as a desirable one. having had few words of commendation for continental tyres in the past, as opposed to their tubulars, the gatorskins were lovely: no skids, no skites and grip when i really, really needed it most (60kph sidewinds). last year was my self-designated year of the handbuilt wheel happily continued into 2009 with a superb pair of handbuilt, three-cross, 32 spoke wheels. style and pragmatism. these were ever confident, never once losing any tension and avoiding the rear brake pads no matter how much climbing torque was applied (and believe me, there were days). it's difficult to sum up a bicycle and a new pedalling experience all in the one review; while fixed is a nice place to visit, i really wouldn't want to live there for too long. however, i'm very glad to have had the opportunity, and if i was going to learn on something, i'm happy it was the club racer. it's not stunningly light compared to contemporary svelte carbon offerings, but sir chris notwithstanding, how many of us need to go anywhere really fast on a fixed? have a word with phil and roger at mosquito, tell them i sent you, and ask them to please sell you an independent fabrication club racer. if, like me, fixed is not your regular place of residence, the frame can also be had with normal road dropouts and a gear hanger. then you can freewheel in modern, craftsman built luxury on a bike which also looks elegant and understated sitting outside the coffee stop. the indyfab club racer retails at £1595 frame and forks. overall price depends on build kit. thanks to joe at indyfab and phil and roger at mosquito bikes. using a flip ultra video camera simultaneously on test, i made the indyfab video review below. please don't laugh when i refer to the rack as a saddle; i was preoccupied. the flip camera review will follow later.